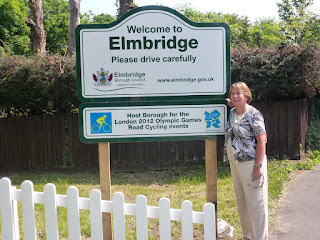 Molesey Conservative Residents: Molesey all set for Olympics! MOLESEY will be looking its best for the Olympic cycling races in a month - with even the Jolly Boatman getting a makeover. Conservative-led Elmbridge Council and MP Dominic Raab have been among those putting pressure on Gladedale Ltd, the developer which owns the derelict Boatman site next to Hampton Court Station, to get it cleared up. And The Molesey News is pleased to report that Historic Royal Palaces is to landscape the site on behalf of Gladedale and in time for the Olympics when thousands of spectactors will come to Molesey. Already litter and debris have been cleared, a fence has been put up around the site, and turf laid (see picture, right) - with the work due for completion in time for Hampton Court Flower Show on July 3. On July 28th, 29th, and August 1st the eyes of the world will be on Molesey when the Olympic cycle races come to town, with competitors sweeping across Hampton Court Bridge and along the length of Hurst Road - passing through Walton and on to Box Hill before coming back to our area via Hampton Court Way. The time trials cycling event on August 1st will see racers using Walton Road. She said the crowning piece will be a commissioned wrought iron sculpture mounted on a rainbow shape which will be installed at the Sadler’s Ride roundabout in July. In addition the ‘Welcome to the Elmbridge’ signs are being replaced with new ones celebrating our Olympic host borough status. Following the games the Olympic portion of the signs will be unclipped and replaced with names of the town visitors are entering. Elmbridge has £178,000 of Government money to spend on Jubilee and Olympic legacy projects, and some £40,000 of this is being awarded to local sports clubs to encourage young people to become more active. Cllr Fuller said: “We set-up a cross-party task group to spend this money and one of the things we are going to do for young people is to put table tennis facilities into five parks. There will be two outdoor tables going in by the Hurst Pool in Molesey in the next two weeks. South West Trains has given Hampton Court Station a lick of paint in anticipation of droves of Olympic spectators decending in July, and the Environment Agency has removed the undergrowth alongside the Thames at Hampton Court Bridge for spectators to stand and watch the races.